An unforeseen twist in the Syria crisis concerning the future of President Bashar al-Assad is looming, according to Russia’s political and business daily Kommersant. "We aren't defending Assad," an unidentified Kremlin source told Kommersant earlier this week. "The president of Syria has missed his chance. The likelihood of him remaining in power is slim, about 10 percent." Eggert is a commentator and host for radio Kommersant FM, Russia's first 24-hour news station. He also writes a weekly column for RIA Novosti. In the 1990s he was Diplomatic Correspondent for Izvestia and later the BBC Russian Service’s Moscow Bureau Editor. Russia has had it its way – there will be no Western military intervention or forced change of regime in Syria; however, the West also seems to have succeeded – Bashar Assad’s fate will soon become a bargaining chip in negotiating future settlements. According to unnamed sources, Russian officials have admitted in private that the Syrian leader has missed the boat and his chances of remaining at the presidential Tishreen Palace in Damascus are slim. Yet Moscow wants him to delay stepping down as long as possible. Back in the spring, Russian Foreign Minister Sergei Lavrov made it clear that the Yemeni scenario for handover of power in Syria would suit Russia. In Yemen, former President Ali Abdullah Saleh handed over the reins to his vice president and retired with a personal security guarantee in his pocket. This scenario will not work in Syria – so much blood has been shed there that the Yemeni clashes will never ever match the Syrian civil war. Furthermore, there are many more religious groups in Syria than in Yemen. The potential future leader of Syria will have to address two tasks that are virtually mutually exclusive – to retain the loyalty of the army that currently supports Assad and simultaneously dismantle the regime. There is no such man in the Syrian opposition at the moment. Assad, who has done his best to keep the Syrian political field barren, now says there is no one to negotiate with. But I guess that nature abhors a vacuum and so the opposition will find someone, while Assad, for his part, will likely eye Minsk as a possible destination. 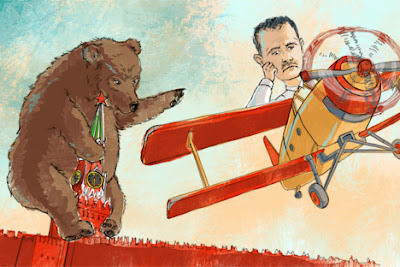 Belarusian President Alexander Lukashenko has nothing to lose by offering asylum to Assad; he has already alienated half the world. The Kremlin, on the other hand, will not be willing to irritate the Arabs by offering the former dictator a new home. The hardest thing to imagine is Vladimir Putin or Sergei Lavrov calling Assad and saying, “Pack your bags. There is nothing else we can do for you.” This will be the end of the special relationship between Moscow and Damascus, which was established 40 years ago during the first years of the presidency of Hafez Assad, the incumbent president’s father. Even if some of Russia’s interests in Syria should be protected by special accords, there will be new people arriving at the Damascus offices, without any Moscow numbers on speed dial on their phones. Separately, Syrian opposition figures are meantime heading to Moscow this week for talks with Lavrov. The Russian foreign minister will meet with delegates from the Syrian Democratic Forum tomorrow, Monday. The Forum’s most prominent figures are Aref Dalila and Fayez Sara. Lavrov is also set to hold talks with representatives of the Syrian National Council (SNC), the country's largest opposition group, on Wednesday. He said the SNC group would be reiterating to Moscow that a transitional government should exclude Assad and his clique but bring together both oppositionists and loyalists. Referring to loyalists, he said Syrian army and Baath Party ranks include many nationalist figures opposed to the regime’s crackdown on its own people.